would this replica (the longer one) be considered an accurate one, and of so from what time period do you think? also would this be exclusively a cutting weapon, or would the thrust also have been effective? to a layman (me) it looks like you could skewer a boar on it. maybe not a mailclad one, though, with a shield. Intresstingly I have found in practise that thrusts are often the winning attacs when fighting with shields. I can elaborate on this for hours but to make it short it has to do with confusing the distance for the opponent with the shield and then do a quick thrust above the rim of the opponents shield straight to his/her eyes. Intresstingly I have found in practise that thrusts are often the winning attacs when fighting with shields. would they be in this case? would that strategy prove efficatious with this sword or, rather, a sword of this type? The Celts are a far ranging people who designed some of the most beautiful objects of art known. Among the first people to use long iron swords, the Celts are also believed to be the inventors of mail. 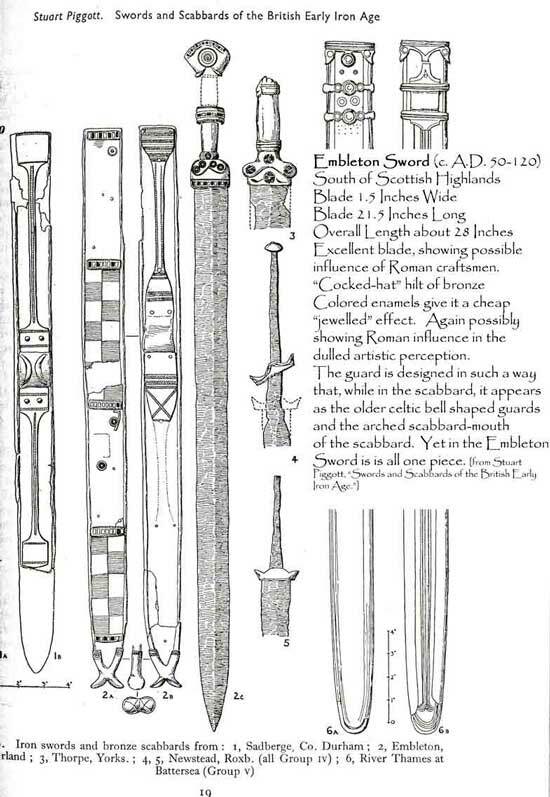 We have reproduced a long sword that is believed to be the forerunner of the spatha and the Roman cavalry sword. Hand forged from high carbon steel, red bronze guard and pommel on either side of the leather covered wood grip. A fearsome sword that smote the enemies of the Celts across the entire continent of Europe. Made by Windlass Steelcrafts®. Comes with scabbard. Overall-37¼" • Blade-31" long, 1½" wide • Wt. 2 lbs. It may be a replica of the Embleton Sword... Celto-Roman roughly A.D. 100. Like you said, it would primarily be a cutting weapon I would think, but could also be a good thruster... The MRL replica is about 10 inches longer in the blade than the Embleton... that may be the reason it looks like a skewer.